SAN DIEGO - Military Sealift Command-chartered container ship MV Ocean Giant has arrived safely at the ice-pier at the National Science Foundation’s McMurdo Station, Antarctica to conduct cargo offloads. 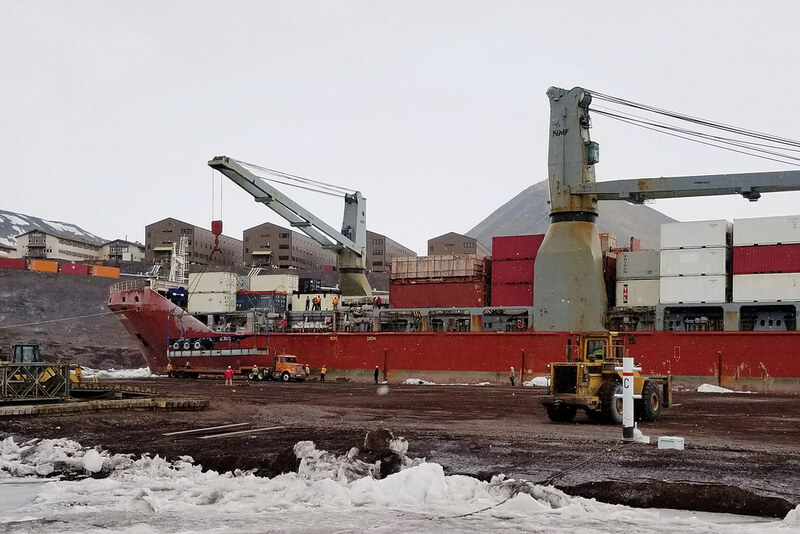 The operation is part of MSC’s annual resupply mission in support of Operation Deep Freeze, the Joint Task Force Support for Antarctica mission to the NSF-managed U.S. Antarctic Program. Ocean Giant, whose mission began in late December, with a loadout of dry cargo in Port Hueneme, Calif., is delivering 498 containers and various breakbulk equaling nearly 7 million pounds of supplies such as frozen and dry food stores, building materials, vehicles, and electronic equipment and parts. Following the offload, 450 containers of retrograde—including station waste and recyclables, which will be returned to the U.S. for processing– as well as ice-core samples for scientific study, will be loaded onto the ship and returned to Port Hueneme. Seabees from Navy Cargo Handling Battalion (NCHB) 1, homeported in Williamsburg, Virginia, have been working around-the-clock offloading the cargo. The cargo handlers work with Ocean Giant’s crew, and the MSC representative, to execute a safe and efficient offload and backload of various containers, breakbulk, and special lifts. Additionally, close coordination is required between NCHB-1 and the Antarctic Support Contract logistics team which manages the loads and stow plans for the Antarctic Program, as well as the New Zealand Defense Force which assists with rigging and transporting loads from the pier to designated laydown areas. Unlike prior ODF missions, where an MSC chartered tanker delivered fuel, this year Ocean Giant’s cargo delivery is the only MSC ship conducting cargo operations at the ice-pier. When most people think of Antarctica, they think of frigid temperatures and a harsh environment. This year, while a Polar Vortex grips the Midwest United States with sub-arctic temperatures and gale-force winds, people in the middle states may be wishing for the Antarctica summer high temperatures that are currently hovering around 20 degrees Fahrenheit. While conditions are currently favorable for cargo operations, seasoned veterans of ODF missions know that Antarctica’s weather is notoriously unpredictable and can quickly change. Because of this, workers anticipate harsh conditions and plan accordingly. Everyone is bundled in heavy winter clothes, and exposure time is limited. Despite the arduous conditions and long working hours, the professionalism of the team shines through, and the mission goes on. Ocean Giant is delivering 80 percent of the supplies needed for the year on Antarctica. With minimal supplies (some do come in on winter flights-PW) coming in once the summer window has closed, the supplies delivered by the MSC ships are vital for survival through the long winter on the most isolated continent in the world. According to Larsson, professionalism and a strong chain of communication is the key to a successful ODF mission. For him, there is a real sense of teamwork between everyone from the National Science Foundation at the top of the organizational chart, all the way down to the workers on the pier. Everyone’s job is an important piece of the mission.